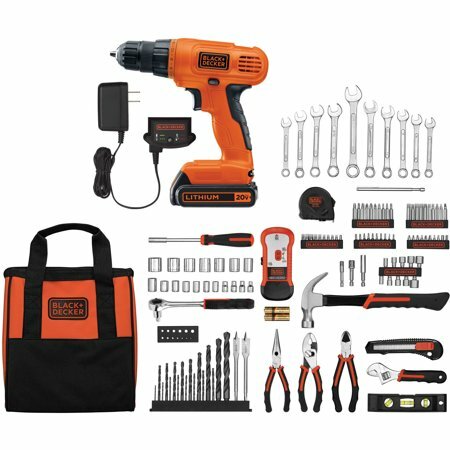 Accomplish a variety of tasks around your home or office with the BLACK+DECKER 20-Volt Lithium Ion Cordless Drill-Driver with 128-Piece Project Kit. This amazing set will help you tackle projects inside and outside while using equipment from a brand name you can trust. The BLACK+DECKER cordless drill-driver comes with dozens of different sized bits to provide a specialized tool for each project. Give someone special in your life a gift they can use all year long that includes a stud finder, socket set, wrench set and so much more. This 20-volt drill-driver has a lithium ion battery included that can hold a charge for up to 18 months when not in use. The battery is also interchangeable with other cordless products in this line and can snap easily into other items like the weed blower, table saw, edger and trimmer.